These days, ozonators have been used for purifying a number of things such as drinking water and even fresh produce. Most of all, ozonators are good for purifying the water of inflatable hot tubs so that the water we expose ourselves to isn’t dirty and full of chemicals. Even if you have the best hot tubs or even the best above ground pool, it helps to have the best hot tub ozonator on top of it. When you’re looking for the best hot tub ozonator in the market for your tub, it’s important to understand how it works. In order to purify the water, ozonators make use of ozone for purification. Ozone used for the spa is basically the combination of a freed oxygen atom with another oxygen molecule. Ozone is formed when a UV light splits an oxygen molecule into two oxygen atoms, and the oxygen atom combines with an oxygen molecule. When this happens, the combination of atoms (3 oxygen atoms) becomes an ozone molecule that is used by the ozonator to clean various objects in the water. The Spa ozonator have a built-in ultraviolet bulb or an ozone converter that would create ozone out of oxygen molecules. When the ozone molecules are created by the ozonator, they are then forced into the spa water in order to sanitize it. 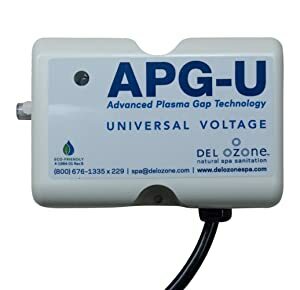 In order to be discharged to the water, the ozone gas is transported through a water jet wherein the jet would act as a vacuum to pull in ozone into the spa water to filter the water. From there, ozone will destroy all the bacteria and viruses and also break down any sort of substance in the water (such as oil or debris) so that the water will be fresh for a longer time. 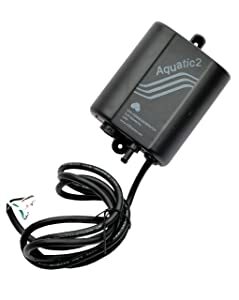 Also, ozonators neutralize bromine and chlorine content without compromising on the cleanliness of the water. Ozone is actually more effective than bromine or chlorine when it comes to cleaning the spa water as its effects last longer. When you use your hot tub ozone generator, you should let it run for at least 3 hours every half a day. If you want better results, then you can actually run it for the whole day. With the ozonator purifying the water, you may now lessen the bromine and the chlorine levels of your spa water because the ozone can do most of the job. You can set your bromine levels at 1.5 ppm and chlorine levels at 0.5 ppm. With the aid of ozone in your spa water, you don’t need to use any chemical cleaner that may be harmful to your skin in the long run. 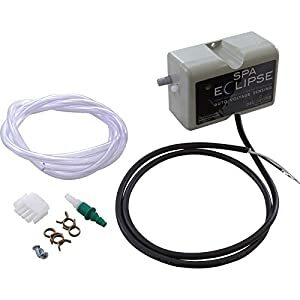 Hot tub ozonators work very well together with your hot tub cleaner and hot tub pump. It is able to neutralize and oxidize the effects of chemicals such as iron, manganese, chlorine, hydrocarbons, sulphides and much more if they are found in the spa water. It can destroy a lot of unwanted substances such as bacteria, molds, fungus, and viruses. With the ozone generator, you don’t need to do so much maintenance work anymore because the ozonator can do the work for you. There is no need to buy so many chemicals and test the chemical level of the water. Unlike when you use a lot of chlorine, the spa water will not smell like chemicals anymore. Too many chemicals such as chlorine and bromine are not good for the health in the long run. Exposing them to your skin or even inhaling them through your nose would have a lot of health consequences in the future. With ozone though, everything is natural, so you won’t have to worry about health problems caused by it. 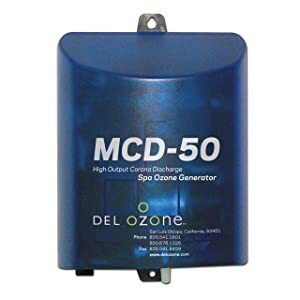 The Del Ozone Spa Ozonator works on a chip technology that conserves energy while still efficiently completing the job. There are few wires and circuits which would make it less prone to short circuits. It is also resistant to water and conserves power in its UV system. It is able to kill 99.99% of harmful substances. It is resistant to water and does not use up much energy in its UV system. It overall does not use up that much energy. It also has a corona chip viewing window. The corona chip makes the machine consume less energy as compared to other brands. The corona discharge chip is quite fragile and needs to be replaced from time to time. The A2Z Ozone generator is one of the most well-known ozonators in the market with a 300 MG ozone concentration level. This makes it one of the best purifiers on the market. It is also known for its compact size, making it easy to carry around and bring on trips. It has an ozone concentration of 300 MG/H which is the highest in the market. It is versatile and can even be used in 100 volts applications. It is small and compact which makes it great to bring around. It does not need any assembling or fixing up of any kind. It is not very durable for heavy-duty jobs. This ozonator has all the features that an ideal ozonator would have such as the ability to oxidize the chemicals in the water and sanitize the water as a whole. It is also known for its extremely easy installation which makes it the ideal ozonator for those who are not very savvy with machines. It easily sanitizes the water in the hot tub. It is able to oxidize most of the chemicals found in the water such as chlorine and bromine. It is very compact and easy to install because of its size. It is not too pricey as compared to many other brands in the market. Other parts like the jetpack and the air tube are not included in the package. This Del ozonator is very well-known for its high-quality system which is able to clean and sanitize pools of hot tubs efficiently. It is also popular for its durability and long shelf life. It can even run for five years. It runs on a universal 115/230 voltage power. It also works very well with an AMP plug. It has a very low power consumption which saves energy. It is good for even 1000 gallons of water. It does not come with an amp plug which is something that a lot of customers look for. It is significantly more expensive than a lot of brands in the market. The Ultrapure Ozonator has a high level of Ozone created and also has a very long lifespan. It also has a corona discharge chip that can help save energy. Its advanced technology allows for it to have an extended lamp life. Moreover, it has an overall long shelf life, which means you can use it for about four to five years. It is able to purify up to 800 gallons of water in the hot tub. It has a CD chip that can last for years without having to be replaced. The CD chip contributes to the whole energy saving of energy. It is also versatile with the voltage having an output voltage of 115/230 volts. It is quite pricey as compared to other brands in the market, but the performance will certainly make up for it. By going through these five hot tub ozonator reviews, we can see that the clear winner of the five products that are listed above is the Ultrapure brand. This is because it has all the ideal features of a hot tub ozonator, and it can also save a lot of energy due to its advanced technology of the CD chip. 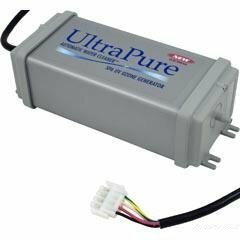 Furthermore, it is very versatile with regard to the output voltage so it can be used in any hot tub pool set. The only con would be its price as it is a little bit expensive than other brands. However, spending a bit more for better quality is definitely worth it and even more practical in the long run. Through the reviewing of several products, we are able to compare and contrast the pros and cons of each, making it easier to choose which one is the best. Selecting the best one will be much easier through this process. In the end, the best ozonator would still depend on the type of hot tub you have, as well as the criteria of your personal preferences.